95 AND 6 TO GO will have a 3-day run at Anthology Film Archives in New York City, from Friday, September 21 through Sunday, September 23. The film will screen at 7:30pm nightly. Director Kimi Takesue will be present for a moderated Q&A after every screening. More information can be found on Anthology's website, linked here. 95 AND 6 TO GO will be screening at Amherst Cinema on Thursday, September 13, 2018, at 7:00pm. Kimi Takesue will be present for a Q&A. Tickets are available here. As part of the DocYard film series, 95 AND 6 TO GO is screening at the Brattle Theatre in Cambridge, Massachusetts at 7:00 pm on Monday, March 12. Director Kimi Takesue will be in attendance for a Q&A with the audience after the film. 95 AND 6 TO GO will have its Southern premiere at Indie Memphis on November 4. The film will participate in the Documentary Competition at Indie Memphis and will screen at 10:30 am at Malco Studio on the Square. Kimi Takesue's ITVS commissioned short film, THAT WHICH ONCE WAS, will play as part of the Flaherty Film Series in New York City! THAT WHICH ONCE WAS had its world premiere at the SXSW Film Festival and went on to screen at over 25 international film festivals. 95 and 6 to Go will have its UK premiere at the Open City Documentary Festival on September 7. The film will be screening at Picturehouse Central. You can purchase tickets by clicking here. 95 AND 6 TO GO premiered in France at FID:Marseille on July 14. The screening took place at Cinéma Les Variétés and Cinema Alcazar. The festival reviewed 95 AND 6 TO GO as "a profoundly moving portrait, which is also that of a wife disappeared but eternally present." 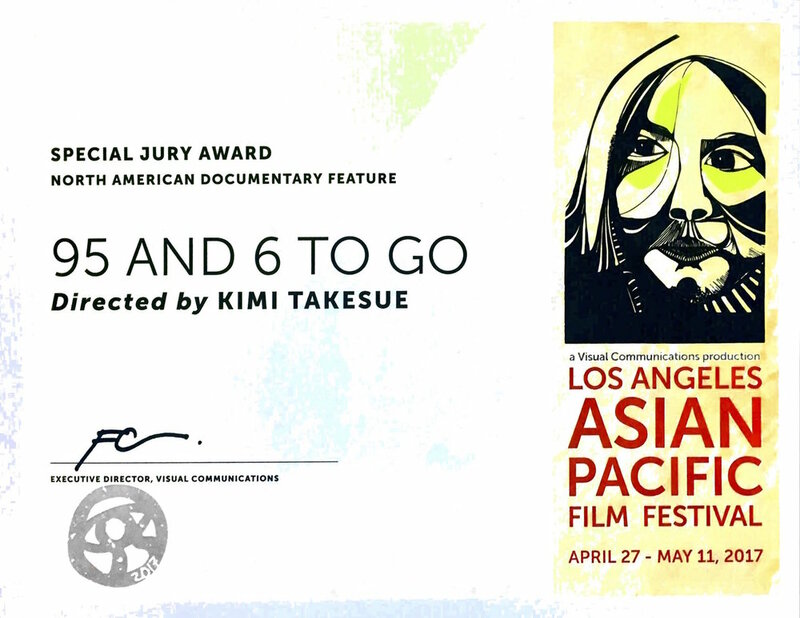 95 AND 6 TO GO won the Special Jury Prize for Best Feature Documentary at the Los Angeles Asian Pacific Film Festival this year. This was the film's second screening in California, shortly after being shown at CAAM Fest in San Francisco. Check out the award below! 95 AND 6 TO GO has been nominated for the 2017 European Doc Alliance Award! The award stems from a collaborative initiative between seven European documentary film festivals: Doclisboa, CPH:DOX Copenhagen, DOK Leipzig, FID Marseille, Jihlava International Documentary Film Festival, Docs Against Gravity and Visions du Réel. 95 AND 6 TO GO was nominated by Doclisboa, where it also had its world premiere in 2016. Read more about the award by clicking here. The film is in many ways a mutually sombre homecoming; the proverbial return to care for one’s elders becomes an active accounting of the past and provokes an unforeseen source of humble creativity.